If [Euclid’s twelfth axiom] is a self-evident proposition, which can neither be proved, nor needs to be proved, how much clearer is the axiom for the existence of God! Hatred of God may bring the soul to God. ‘Ribh Considers Christian Love Insufficient’ (VP 558) Boehme, Theosophische Wercken, ed. Gichtel (1682), frontispiece to Forty Questions of the Soul. He sees his indifference to Christian belief as ‘predestined’ by his antithetical nature, so that, in the terms of his System, he would actually be living ‘out of phase’ if he tried to ‘become a Christian man’. To some people Yeats’s position seems a paradox: that of a spiritual man who believes in the supernatural, but is unconcerned with God. T. S. Eliot cited I. A. Richards’s assertion that Yeats repudiated ‘life itself, in favour of a supernatural world’ and went on to dismiss it as ‘the wrong supernatural world’. Yeats’s supernatural world was wrong for Eliot, because it ‘was not a world of spiritual significance, not a world of real Good and Evil, of holiness or sin, but a highly sophisticated lower mythology’. When Eliot made these comments in a lecture in 1933, he was championing the higher religion with the force of a convert, having been received into the Church of England in 1927, but it is also true that Yeats’s mythology is generally situated at the intermediate level of the psyche rather than either the numinous or the phenomenal. A Vision is a mirror of the angelic and the human, Speculum Angelorum et Hominum, but not a ladder towards understanding of God, Eliot’s ‘world of spiritual significance’, or for reaching the material world of Nature, Richards’s ‘life itself’. From the human perspective, there are two fundamental views of reality: the antithetical or Lunar which starts from below, and the primary or Solar which starts from above (see the Tinctures). The primary, as the name indicates, has primacy and Yeats acknowledges that unity is the source and the goal of existence. The antithetical, as the name indicates, defines itself by antithesis to and conflict with the primary and is therefore a necessarily second term. Yet, since we live in an epoch where the primary civilisation is reaching its maximum and the primary religion is still dominant (see History), the primary viewpoint has held sway throughout the culture for almost a thousand years. Seeking to redress the balance, A Vision’s emphasis is therefore towards the antithetical, towards the forms of multitude rather than the single, overwhelming truth. It accommodates the primary, in part, as Adams claims, because it ‘expresses antithetical commitment, not only to images but also to letting the primary have its place and say. The antithetical can open itself to contrariety with the primary, but the primary always tends to suppress or negate the antithetical’ (BYV 101-02). In contrast, the primary outlook tends to discount the antithetical as inferior, as Eliot does with his dismissal of ‘lower mythology’. One of the assertions of A Vision is that the primary, God-centred view of the world is only part of the totality, and that, in Blake's phrase, to decree one law for the lion and ox is oppression. I think that two conceptions, that of reality as a congeries of beings, that of reality as a single being alternate in our emotion and in history, and must always remain something that human reason, because subject to one or the other, cannot reconcile. I am always, in all I do, driven to a moment which is the realisation of myself as unique and free, or to a moment which is the surrender to God of all that I am. . . . Again and again with remorse, a sense of defeat, I have failed when I would write of God, written coldly and conventionally. Could those two impulses, one as much a part of truth as the other, be reconciled, or if one or the other could prevail, all life would cease. Part of the reason for this coldness, is probably owing to Yeats’s inability to think in terms of a personal God, which was certainly influenced by his early contact with Theosophy. Theosophy is largely unconcerned with Deity, positing an impersonal Absolute: ‘Our DEITY. . . is everywhere, in every atom of the visible as of the invisible Cosmos, in, over, and around every invisible atom and divisible molecule; for IT is the mysterious power of evolution and involution, the omnipresent, omnipotent, and even omniscient creative potentiality’ which does not think, ‘for the simple reason that it is Absolute Thought itself. Nor does it exist, for the same reason, as it is absolute existence, and Be-ness, not a Being. . . . It is a sphere, without circumference, in its symbolism, which has but one ever-acting attribute embracing all other existing or thinkable attributes - ITSELF’ (KT 64-65). Conversely, man is not only a God, but God, since ‘the inner man is the only God we can have cognizance of. . . . Grant us our postulate that God is a universally diffused, infinite principle, and how can man alone escape being soaked through by, and in, the Deity?’ so that prayer, such as it is for the Theosophist, is the manifestation of ‘Will-Power’ and should be addressed to the spiritual principles within, while ‘crushing out the desires of the lower personal ego or physical man’ (KT 68); ‘Since we believe in no personal God, how can we believe that he endows man with anything’ (KT 75). In 1909, Yeats records an acquaintance commenting of ‘the Dublin theosophists’ that, ‘They are all self, all presumption. They do not know what it is to abase themselves before Christ, or their own Gods, or anything’ (Au 479). Such lack of worship and emphasis on the inner man seems to have been congenial to Yeats. 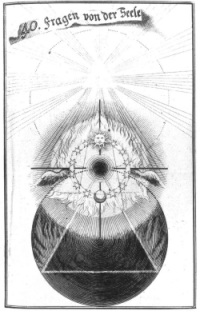 Though the Cabbalism of the Golden Dawn gave a more prominent role to God, making His names the very basis of magic, the Tree of Life is almost as pantheistic as the Theosophical idea of Deity in every atom, and the intermediary, angelic forces of the Sephiroth are of more immediate importance than the true Godhead which dwells beyond the Tree itself in Ain Soph Aur, ‘Endless Light’. William Wynn Westcott, lecturing to the Adepti of the Order, speaks of ‘God, or the Divine Powers’ and seems to feel happier with the latter phrase, or equivalents such as ‘the Elohim of Life’ or ‘the All self—the great One All’, but at the same time, if the ‘great Jehovah . . . made man in the Garden of Eden, it matters not to me’. He admits that, ‘There may be a final Heaven, a final rest, a re-absorption into Deity, but this is not yet. The ladder of progression form earth to heaven must be climbed, before the foot can attain the summit’, but his concern is not with God or ultimate ends so much as Man and means: ‘Let us then make Man—make the Divine Man out of the Human Man’ (RMGD, 127-130). Yeats seems similarly unconcerned with ultimate beginnings or ultimate ends and similarly focussed on the process, and to have carried these attitudes into his approach to his own System. In A Vision Yeats adopts the symbolism of the Sphere to speak about the ‘ultimate reality’, the impersonal divine, but even this conception is too remote, since it transcends human experience by reconciling all opposites within itself. Within the System of A Vision, the active form of the divine is the ‘illusory form’, the ‘Thirteenth Cone’. It is partly in order to escape from the traditional attributions that even vaguely divine terminology such as ‘the All One’ or ‘Spiritus Mundi’ might bring to his conception, that Yeats adopts such an unlikely name. One can hardly use a personal pronoun of a Cone, as Ellmann comments, ‘To give God so mechanical a title was to ensure that He would be discussed only as “it”, never as a personal deity, least of all as a Christian one’. Elsewhere Yeats shows a definite distrust for the word ‘God’, writing in a draft for AV B that, ‘Plotinus has somewhere described God and Man (or as I prefer to say Macrocosm and Microcosm) as two spheres which no longer coincide.’ He prefers, if possible, to distance the terms from the concept of any personal God, seeing God as the greater cosmos rather than the shepherd of the stars, let alone the listener to prayers. Even so, when he is writing about this apparently geometric Thirteenth Cone he can still use the language of theology, commenting that: ‘All imaginable relations may arise between a man and his God’ (AV B 240). Like the Daimon, the Thirteenth Cone is a form of dualistic opposition, but whereas the Daimon stands in opposition to the individual human being, the Thirteenth Cone opposes the whole of manifestation. In essence the idea of the Thirteenth Cone is pure antithesis. Whichever aspect of existence we choose to consider it is represented by a gyre or cone, and it has as its complement a ‘contrasting cone as the other half of the antinomy, the “spiritual objective”’. On the largest scale, within the Great Year‚ this contrasting gyre is called ‘the Thirteenth Cycle or Thirteenth Cone’, since it stands against the twelve months of the Year, and this name is adopted generally. While we remain within the gyres, it appears as the opposing gyre or cone ‘the antithesis to our thesis’, but if we could view it outside of the antinomies we would recognise it as a ‘phaseless sphere’ (AV B 210). Its conic or gyring form is an illusion but one which persists as long as we are confined to the gyres ourselves. It applies at all scales but it is most appropriately identified within the largest, since it is within the Great Year, which is symbolically also a complete total of human incarnations, that it is seen as the terminal or next stage, at which point the soul may transcend the antinomies. In reading what I have written of the Wheel of Birth & death or that of the 28 incarnations, or the wheel of history which I have yet to examine, the reader must always assume that there is a spiritual wheel, [which is] its antithesis & which acts upon it as man upon woman. I have dealt & shall deal only in the most summary way with this other wheel[,] the sphere in its illusory form as the 13th cone[,] that I may keep as much as possible to the concrete & the phenomenal. The two wheels live each others death, die each others life. Though it forms a vital part of the system, Yeats continually finds that the supernatural turns him to the natural, and that the abstract is dealt with summarily. He therefore largely demands that his readers take this spiritual wheel as understood, leaving them to extrapolate its condition from the rest of the System; even this disclaiming rider was finally excluded from the published form of A Vision. Reiterating the Heraclitean phrase that he used constantly to epitomise his thought, Yeats shows that what can be said of man and the Daimon can be applied in more general terms to the multifarious cycles of life and their antitheses, which are subsumed in single form of the illusory Thirteenth Cone. In a typically Yeatsian image the relationship between the two antitheses is seen in the relationship of man and woman, but though the spiritual cone is to us as a man is to his partner, Yeats is more interested in the woman. On the few occasions when he does approach the concept of transcendent reality, he prefers to discuss the illusory form to the eternal one. The Sphere is beyond opposites, androgyne or sexless, and it is the separated, sexual opposition that dominates his thinking. This ‘spiritual wheel’ is neither a cone, nor is it the thirteenth of any series: it is merely our perception of it that may make it seem such and, though it is also described in terms of a place, a state of being and a stage of initiation, the Thirteenth Cone is none of these; like the Sphere it ‘can be symbolised but cannot be known’ (AV B 193). Since it opposes and fulfils every form of gyring from the infinitesimal to the infinite, the Cone can appear as a moment, being, state, even a place and time, opposing whatever unit or ‘arrangement of experience’ we propose. The counter-wheel can be symbolised through the multiple correspondences of the phasic wheel, which ‘is every completed movement of thought or life, twenty-eight incarnations, a single incarnation, a single judgment or act of thought’ (AV B 81) and is whatever the mundane wheel is not. The reason for the term ‘Thirteenth’ goes back to the origins of the term in the ‘Thirteenth Cycle’. The twelve preceding cycles are the Cycles of 28 incarnations each, which also ideally correspond with the twelve months of the Great Year. When seeing how the Thirteenth Cycle is of a different order from the preceding twelve, it is helpful to view the twelve Cycles as forming the colures of an armillary sphere rather than as a linear or even spiral sequence; once the final segment of the Sphere is completed in the final round, the Sphere is itself completed. The individual human has passed through each archetypal Phase at twelve different levels and thus completed the single archetype of its being, adumbrated in the Daimon and Ghostly Self: ‘Then there will come the first of a new series, the Thirteenth Cycle, which is a Sphere and not a cone’ (AV A 170). Until the Sphere is completed it does not exist at all and is present only as an idea of what will become. Since we will reach this transcendent other at the end of a series, we perceive it as part of that series, and when we perceive it in the present it appears to be those segments of the Sphere that remain unexperienced or that complement the current round. Each Cycle is made up of 28 Phases, Phase 8 is ‘on the equator’ of the movement towards the South at Phase 15, and Phase 22 is ‘on the equator’ of the northwards movement; here the Seventh Cycle appears at both edges of the Sphere with the individual Phases marked out. When the 28th Phase of one Cycle is finished, the being enters the 1st Phase of the next Cycle; when Phase 28 of the 12th Cycle is finished, the Sphere itself is complete: ‘Then there will come the first of a new series, the Thirteenth Cycle, which is a Sphere and not a cone’. The Twelve Cycles forming a Sphere. I shall consider the gyre in the present expanding cone for the sake of simplicity as the whole of human life. . . and the contrasting cone as the other half of the antinomy, the ‘spiritual objective’. Although when we are in the first month of this expanding cone we are in the twelfth month of the other, when we are in second in the eleventh of the other, and so on, that month of the other cone which corresponds to ours is always called by my instructors the Thirteenth Cycle or Thirteenth Cone, for every month is a cone. It is that cycle which may deliver us from the twelve cycles of time and space. The cone which intersects ours is a cone in so far as we think of it as the antithesis to our thesis, but if the time has come for our deliverance it is the phaseless sphere, sometimes called the Thirteenth Sphere, for every lesser cycle contains within itself a sphere that is, as it were, the reflection or messenger of the final deliverance. The Thirteenth Cone is the spiritual opposite to all existence, and the cone that runs counter to the Great Year, and in which the months complement ours, represents an aspect of the Thirteenth Cone. The months always make the sum of 13, showing not the diametrical opposition seen in the Faculties of Will and Mask, which increase together, but the Solar-Lunar opposition of Will and Creative Mind where one decreases as the other increases, so that, except at Phase 1, they always make the sum of 30 (c.f. Double Wheels in the Great Year). In other ways the opposition of the seasons seems to imply the form of opposition of the Mask, or a form of supernatural antipodes, so that the Thirteenth Cone may be thought of a subsuming all the forms of contrast, both those of Opposition and Discord. The cone will be seen as the Sphere only when the twelve cycles are completed, and the Thirteenth Cone cannot or does not hasten the end, it delivers not in the manner of a rescuer but rather as a midwife when the due time has come. However, each cone is already related to a Sphere, both in origin and in goal (c.f. AV A 133). The resonance of its creation from the Sphere in the past is also the reflection of its completion in the future, or quasi-angelic ‘messenger of the final deliverance’. Every cone is partial, and lacks: that lack is answered by the Thirteenth Cone. We view the answering form as a reflection of our own state, but together the two cones of the spiritual with the mundane are potentially reintegrated into the spherical. Yeats does not intend the phrase ‘spiritual objective’, first and foremost, to mean spiritual goal, although there is inevitably an element of this. Rather it is the spiritual objective as contrasted to the worldly subjective, for: ‘The 13th cone is the only thing that is entirely objective & therefore fated, when considered by the antithetical human race. We are who we are because of the assertion of our subjectivity’. The Thirteenth Cone is the essence of objectivity, of that which is set against our subjective consciousness, and against which we struggle to win our separation, so paradoxically ‘It is at the moment of our greatest denial of the Devine & God that we are nearest to realization of his divinity’ (YVP 3 175). It is one thing to see the Thirteenth Cone as being entirely alien to humanity, its necessary complement or as an anti-universe, which is counter to all phenomena; it is quite another to see it as God. Graham Hough, for one, is unconvinced about the Thirteenth Cone’s divinity: ‘Ellmann is persuaded that the Thirteenth Sphere or Cycle is Yeats’s equivalent for God; but though the language used towards the end of A Vision is exalted I do not think it reaches as far as that; Fate or Fortune perhaps, but not God’. Much depends, really, on what is meant by God and what the individual feels are necessary qualities for the Divine Being. When Yeats, however, in his diary of 1930, considers Berkeley’s idea of God creating what we perceive, he continues: ‘I substitute for God the Thirteenth Cone, the Thirteenth Cone therefore creates our perceptions-all the visible world-as held in common by our wheel’ (Ex 320), and it is clear that for Yeats himself the Thirteenth Cone must be seen as representing the divine, at least substituting for God in creating perception. In A Vision itself he even appears to attribute a form of consciousness to the Thirteenth Cone: ‘The Thirteenth Cone is a sphere because sufficient to itself; but as seen by man it is a cone. It even becomes conscious of itself as so seen, like some great dancer, the perfect flower of modern culture, dancing some primitive dance and conscious of his or her own life and of the dance’ (AV B 240). In this image the Thirteenth Cone is portrayed as a being which consciously affects a mask, which it knows is separate from its own conception of itself, yet which it is willing to engage with, as a distorted reflection. The Sphere is God in so far as the truly divine includes all, exists in creation: the Thirteenth Cone is God in so far as God is distinct from and opposes creation, or as spirit is distinct from matter. As Yeats learned from Shri Purohit Swami if not earlier, to the main schools of Vedanta dualism is an illusion, but Advaita Vedanta is called ‘non-dualist’ rather than ‘unitary’, because it recognises that the roots of duality are deep, and that matter and spirit both exist in their own modes. Godhead or Brahma alone is real and the objective reality of the world an illusion, but neither real nor non-real, while the subjective self-hood at the root of the individual being is real but restricted in its outlook. In a classic parable of Sankara’s teaching, a rope that is mistaken for a snake is not a snake, but neither is it unreal just because the perceiver is mistaken about what it is. Similarly the Thirteenth Cone is an illusory form, but it still exists, even if we cannot perceive it aright. Yeats’s thinking about the divine may be unorthodox in traditional terms, but, aside from its very idiosyncratic formulation, shows affinity with certain strands of philosophical thinking in the nineteenth century. Hegel, according to Yeats’s reading, ‘made all things end in Gods realization of himself’, and Yeats’s comment echoes similar use of Hegel’s thought, such as that of Ernest Renan. In a philosophical dialogue, Théophraste, Renan’s mouthpiece, says that he does not exactly think ‘like Hegel, that God is not, but that he shall be’; in his conception ‘the ideal exists; it is eternal, but it is not yet realised in matter. It will be realised by a consciousness analogous to that of humanity, but infinitely superior. . . . The universal work of all that lives is to make God perfect, to contribute to the great, definitive completion which will close the circle of things in unity’. Renan contemplates a divine nature, which at present exists as the Ideal, but exists only potentially, in principle rather than in reality: the Ideal is the guiding impulse, ‘the principle of deific evolution, the creator par excellence, the goal and first mover of the universe. . . . All derives from matter; but it is the Idea which animates everything, which, in aspiring to self-realisation, drives towards being. There is God. . . . Idea is a virtuality which wants to be; matter gives it concreteness, makes it come into being, into reality’. Though it is unlikely that Yeats had read Renan’s untranslated dialogues, Renan treats, in abstract terms, concepts similar to those treated symbolically by Yeats. To Hegel himself, history is the process of Geist or Absolute Spirit coming to know itself first in nature, then in human consciousness and history, and ultimately all exists in Geist, Spirit or God. In its desire to manifest and know itself, it must become real, especially through the particular: material things, individuals and in the process of change and history. Alfred North Whitehead developed from such thinking the idea of Process Theology, and, though Yeats doubted that Whitehead would recognise his abstract thought in the mythic formulation of A Vision (viz. L 712), he felt that he was in fundamental agreement with Whitehead’s philosophy, which among other things shows implicitly how the divine totality changes as its constituents progress and seeks to embody all that is potential within it in actual manifestation. Yeats actually compares Whitehead to someone who ‘has written down the game of chess, while I, like some Italian Prince, have made the pages and the court ladies have it out on my lawn’ (L 712). And the elements which recall more modern philosophy on the nature of God sit alongside those which are more in keeping with Renaissance thinking. One of the foundations of the idea of Microcosm and Macrocosm is that the Microcosm reflects through correspondence the nature of the Macrocosm, and it is in the human Principles, in particular, that we can discover the nature of the divine spirit. Through the Principles Yeats partly compensates for his neglect of the divine; he wishes to concentrate on the phenomenal and to avoid noumenal abstractions, and the Principles bring the divine to human proportions. Both soul and godhead can be said to be ‘“that which has value in itself,” or you can say of it “it [is] that which we can only know through analogies”’ (L 825). The ultimate Sphere is of itself ineffable, the Cone largely expressible only in the language of opposition; we must use the language of analogy and in talking of the ‘lower’ forms, such as the Principles, the analogy is merely taken a step further. The Divine Ideas which exist in the Sphere in their unity, in potentia, are reflected in the Microcosmic form of the Celestial Body, to be realised in fact through the material cosmos, the lower Principles and Faculties. may be described as the imagination of God without which neither Father, Son, nor Spirit could be made manifest in life and action. . . . To this emanation, to give it the Blakean term, of the Father, is constantly applied by Boehmen the word ‘looking-glass’. . . . God looking into this mirror, ceases to be mere will, beholds Himself as the Son, His love for His own unity, His self-consciousness, and enters on that eternal meditation about Himself which is called the Holy Spirit. . . . The role of the matrix is to make the Trinity ‘manifest in life and action’, just as the role of the Husk is to give the other Principles their necessary manifestation as the creative Faculties and to maintain their connection. The Holy Spirit of Yeats’s Blake ‘is the energy which wakes into being the numberless thought-forms of the great mirror, the immortal or typical shapes of all things, the “ideas” of Plato. It and the mirror make up together divine manifestation’ (WWB 1 247). The matrix can also be seen as the receptive womb of creation (matrix is Latin for ‘womb’ or ‘brood-mare’), so that the three must become four in order that creation might be manifest. And Yeats evidently carried the idea with him into the creation of the System of A Vision, writing to Thomas Sturge Moore in 1926: ‘Personally I believe there is a Matrix but that Matrix seems to me living and active, not a mere logical possibility. But that is a long story’ (TSMC 83). See Appendix. In the separation of the Microcosm from the Macrocosm, the individual wins its separateness from the mass, from the unity of identification, and yet ultimately is taken back into unity and is freed from the pain of isolation: ‘Whatever existence we think of, a Civilisation’s or an individual’s, it arises from the general mass, wins its victory and returns.’ Yet the Thirteenth Cone, the ‘general mass, call it Nature, God, the Matrix, the Unconscious, what you will,’ requires the separated Microcosms, and only ‘becomes a unity when interlocked with some separating or subsiding existence; nor is it greater than that existence’ for it needs the separate existence to realise its potential in reality. In conventional terms, Graham Hough is right to distrust the identification of the Thirteenth Cone with God: the Sphere of God is more total than the Thirteenth Cone, and is also more total than most conventional formulations. The Sphere is all, but since it is all it is also nothing and having all qualities it has none, like the Gnostics’ ‘Pleroma’, and must therefore include manifest reality, though because we view it from one ‘half’ it appears to us that the other half is that totality. René Guénon, writing in 1932, similarly draws attention to the impossibility of using language to talk about the Infinite, which can only be affirmed by negation since any affirmation is necessarily limited. He also demonstrates that discourse becomes paradoxical when trying to treat of the One: ‘Primordial unity is in fact nothing other than the affirmation of Zero. In other words, universal Being, which is this unity, is nothing other than the affirmation of Non-Being, insofar as such an affirmation is possible’. Yeats conceives of a deity, but it is one which is so total as to be without interest to the poet, although the saint or mystic may strive to know the whole. To the antithetical Yeats the divine is largely irrelevant to the human; he does not deny God, but questions His importance in an understanding of the world of phenomena, and like the Zen Buddhism described by Suzuki seeks ‘to see into the work of creation and not to interview the creator himself’ and wants freedom, even from God. If religion becomes ‘so wholly supernatural, that it is so opposed to the order of nature that the world can never capture it’ (VPl 1133) then it loses relevance to the natural and to the human, and in part Yeats deliberately abstracts Deity to a Primary geometric extreme in order to escape from it. His System’s philosophy deals in natural supernature, arising from the human rather than descending from the divine like a religion (viz. YVP 2 269). What covered all? What held all up? And where were the deep waters? be he does not know. Yeats, like the Indian sages is ready to explore the root and seed of desire, and to examine thought, but the ultimate origins are so inscrutable as to be hidden even from the gods of this world, and possibly even from the creative force itself. Doubt and uncertainty are paramount, and it is not for the mind of man to try to fathom the darkness. By doing so he is able to concern himself with the mundane, and know that he is not neglecting his proper work. For further consideration of this concept, see the essay "The Thirteenth Cone," by Neil Mann, in the collection W. B. Yeats's "A Vision": Explications and Contexts, edited by Neil Mann, Matthew Gibson, and Claire Nally (Clemson University, 2012). Macrocosm and Microcosm from Franz Hartmann, Cosmology; or, Universal Science. Containing The Mysteries of the Universe . 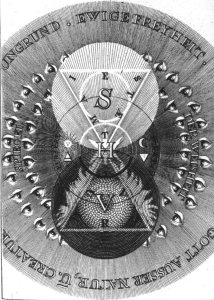 . . explained according to the Religion of Christ, by means of the Secret Symbols of the Rosicrucians of the Sixteenth and Seventeenth Centuries (Boston: Occult Publishing Co., 1888), Part 2, Plate 4 (detail). The dualism of God and Nature: Yeats sometimes uses Nature as partially synonymous with God, both being the goal of primary Phases, God from Phases 22 to 28 and Nature from Phases 2 to 8, in which sense “Nature is the true image of God”; however in other places he differentiates them, seeing the movement from Phase 1 to Phase15 as the movement towards Nature and the movement from 15 to 1 as towards God (AV B 202-03). In this sense, Nature, as individualisation and linked to Man, is linked with the antithetical. Both aspects of this dualism are present in the diagram above. The two groups of circles or spheres, God and Nature, are given seven stages, lettered TINCTUR, moving both inward and outward. The antithetical and primary Tinctures are the dualistic motive force of the Universe through the tension between them. After the central monad, each subsequent level is divided into four quarters, although this does some violence to triadic aspects within the divisions. Each Person of the Christian Trinity is “1 and 3”, however, in the divine circle the Trinity is given a fourth counterpart, Verbum in Natura, the Word in Nature, linked in the 4th midpoint circle of God Father, God Son and Holy Ghost, with the Virgin and Child, which corresponds quite closely with Yeats’s posited Matrix (womb), as the mirror in which the Trinity, but specifically the Holy Ghost, is reflected (see WWB 1 246-50; TSMC 83). In the natural circle, the three Paracelsian elements (sulphur, mercury and salt) are joined by a fourth, Corpus or Body, which apparently corresponds with the form of the Ultimate Matter. Although there is no immediate correspondence between these and the four Principles and four Faculties, the scheme is consonant with this type of division and Yeats suggests specific correspondences between the Principles and Christian and Neo-Platonic divisions (AV B 194), and a four-fold structure dominates the geometries of A Vision.